Are Quarterbacks Really More Consistent Than Running Backs? Archived Content Are Quarterbacks Really More Consistent Than Running Backs? Plenty has been talked about with position consistencies. In fact, the reason fantasy owners are choosing Aaron Rodgers over elite running backs this year is because they feel he is more likely to produce top positional numbers. Compare that to Ray Rice, Arian Foster or LeSean McCoy, and there’s more of a risk. The fact, however, is that all of these players have nearly the same likelihood of flopping, or finishing outside of their expected rank. I’ve got a chapter dedicated to this idea of position consistency in The Late Round Quarterback, but to give you an example, I’ve provided an analysis using the 2010 and 2011 seasons. I use what I like to call the “Starter Index”. What does the Starter Index number represent, you ask? It identifies how players rank to the rest of the starters at a given position, and in this case, in a 12-team league. For example, if Aaron Rodgers finishes as the best quarterback as he did last season, his Starter Index is 100, as he is the best starter at his position. The number 100 is the best score a player can obtain. The “-1” portion of this formula is used so that the best player at his position can be given a 100 Starter Index score. In addition, because of this, the worst starter at this position does not have a score of 0. We’re comparing the final rankings of players, and how they stack up to the rest of the starters in a fantasy league. And because I’ve ordered it by pre-season ranking, we can see how the typical pre-season ranked quarterback and running back compare to their actual output, or Starter Index number. I’ll get more into these charts in a second. The reason I wanted to do this sort of analysis is because of my last post on Value Based Drafting. You see, if you use VBDv2, then you’re assuming that all positions have an equal likelihood of flopping, or finishing outside of their expected rank. In order for VBDv2 to be completely accurate, the chance of Aaron Rodgers not finishing as the top quarterback would have to be the same as Arian Foster (or whomever is your top ranked running back) not finishing as the top running back. There’s some room for error at the running back position, however, as VBDv2 shows that running backs are plenty more valuable than quarterbacks. Well, first, there are many additional factors that help conclude that the value of a quarterback is less than a running back or receiver. For instance, the fact that they are more replaceable through the waiver wire when the season begins is something that’s overlooked by many at draft time. Go ahead and get your quarterback first. Good luck trying to replace your injured running back when your backup running back was a 6th or 7th round draft selection. The fact is, the numbers are a lot closer than you think. Over the last 2 years, starting running backs have had similar success at finishing within their expected draft position when compared to starting quarterbacks. In 2010, 4 of the top-12 quarterbacks actually finished outside of the top-12 at season’s end. The 2011 season was no different. At running back, 8 of the top-24 in 2010 finished outside of the top-24. The next season, this number was 9. So, it appears as though 8 of the 24 quarterbacks over the last two years have failed to live up to expectations. And furthermore, 17 of the 48 starting backs have failed to live up to their pre-season hopes. That’s 33% of quarterbacks and 35% of running backs. Are quarterbacks now more consistent? Well, not exactly. That’s why the Starter Index is important. If we take the average SI (yeah, I just initialed that), then we can more accurately tell how well a player will perform from a consistency standpoint. For instance, we may know that the rate of flopping for a top 24 pre-season ranked running back over the past two seasons is 35%, but what would we expect from a player that doesn’t flop? Of the pre-season ranked starting quarterbacks (top 12) in 2010, the average SI of the players that didn’t flop (8 of the 12) was 56.25. At running back, the top-24 running backs, on average, yielded a 54.53 SI. Remember, in 2010, the running backs that finished outside of the top 24 had an identical percentage as top-ranked quarterbacks – 33%. In 2011, the same analysis produced an SI of 59.5. At running back last year, the SI was 58.13. Keep in mind, however, that the rate of flopping for running backs last season was a tad higher, with 9 of the top 24 backs finishing outside of the top 24. At quarterback, this number was consistent with 2010 at 8. Clearly the Starter Index numbers are quite close when it comes to starters as a whole, but what about the players in the top 50% of their position? In other words, what would we expect out of top 6 quarterbacks and top 12 running backs? At quarterback in 2010, the mean SI of top 6 quarterbacks was 68.2 with a flopping rate of 17%. The same season, top 50% running backs produced an average SI of 59.33, with a flopping rate of 3/12, or 25%. Last season, known by many as The Year of the Quarterback, top 50% pre-season ranked quarterbacks produced an average SI of 63.4. Their rate of flopping was identical to 2010: 17%. At running back last year, the average SI of the top 12 guys was 66.4 with the rate of flopping exactly the same as quarterbacks. Again, these numbers are fairly similar. Curious about the top-tiered guys now? In 2010, the top 3 quarterbacks finished with an average SI of 75. All three quarterbacks pre-season ranked in the top 3 finished the season as a starter in a 12-team, standard scoring league. At running back that same season, the top 6 running backs averaged an SI of 62.5. None of the running backs finished outside of being a starter, either. Last year showed us that, at quarterback, the average SI between the top 3 quarterbacks was 69.67. None of them flopped, either. At running back, there was one flop in Jamaal Charles because of his early season injury, but of the 5 other backs that didn’t flop, their average SI was 79.4. So what does this all mean, exactly? Well, the common perception around fantasy football strategy is that quarterbacks are much more consistent than running backs. The reason this insight exists is because quarterbacks have longer life spans in the NFL. When we see the same players topping the fantasy charts, we automatically credit this to fantasy football value. The problem with this conclusion, however, is that there are still new quarterbacks breaking ground and entering the fantasy ranks as starters, and they’re nearly just as inconsistent, as I’ve shown you, as running backs. 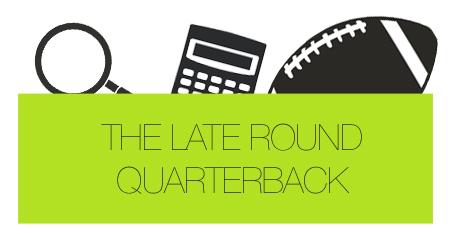 I have more seasons analyzed in my e-book, The Late Round Quarterback. I can tell you that, yes, the numbers have gotten better for quarterbacks over the years, but even just using the last two seasons (the two seasons where top quarterbacks have dominated the NFL most) the consistency from running back to quarterback is pretty similar. Alright, so quarterbacks as a whole appear to be barely more consistent. It may come as a surprise to many that these are the numbers produced at these two positions. Everyone automatically thinks, “running backs get hurt all the time! Of course quarterbacks will be way more consistent!” Well, even with injuries taken into account, we can see that running backs are nearly just as consistent as quarterbacks. If you’d like to assume that my analysis is incorrect (after all, I’m only showing two years of analysis…get my book for more), then I can further explain why getting a quarterback early in the draft is a wrong decision. Even if we were to assume quarterbacks have a 5%-10% better chance of returning draft day value, there are plenty of reasons why you should wait on them. Potential starting quarterbacks will be available in free agency. It happens every year. Fantasy football history tells us that, at running back, end of the season starters will be drafted. While we saw Arian Foster’s breakout season a few years ago, we also saw him being drafted in nearly all fantasy leagues. In other words, it’s awfully difficult to get a starting running back off the waiver wire compared to quarterbacks. And if you’re trying to get a running back off the wire, so is the rest of your league. Good luck fighting for that guy. If your running back goes down to injury, you won’t lose a step in replacing him. Quarterback Bro is going to have a mighty hard time getting an alternate back. Don’t believe me? If Quarterback Bro decides to get a starting running back in round 6 (which is very possible if he gets a quarterback before that), then his backup running back could be drafted in round 7 or 8. The chance that these backs finish as startable is much, much lower when compared to a 7th or 8th round quarterback. If your quarterback goes down to injury, to point number 1, you can replace him. If your quarterback flops and you get him round 8, you don’t feel bad. You can get a new one via trade or off the wire. You should want the most valuable team possible. By reaching for Tony Romo in round 4, for instance, would be like reaching for mediocrity. Yes, he had a season where he finished 2nd amongst quarterbacks once in his career, but he’s also been a middle of the road starter in most 12-team leagues. Why reach for average in an early round? Shouldn’t you want the best? This whole analysis is based on many, many dynamic items. For instance, not everyone is going to have the same rankings. And moreoever, not all leagues use standard scoring. But you can’t analyze the importance, consistency and value of a particular position without doing some sort of pre-season to post-season analysis. People are becoming more confident with teams that consist of an elite quarterback and risky running backs. If running backs are much more difficult to replace when the season begins, and top running backs are nearly just as consistent as top quarterbacks, then why aren’t we taking the sure bet at the running back position during our drafts? It’s up to you. You can agree or disagree. But there’s on right answer at this point in fantasy football and the NFL: You don’t need your quarterback early.